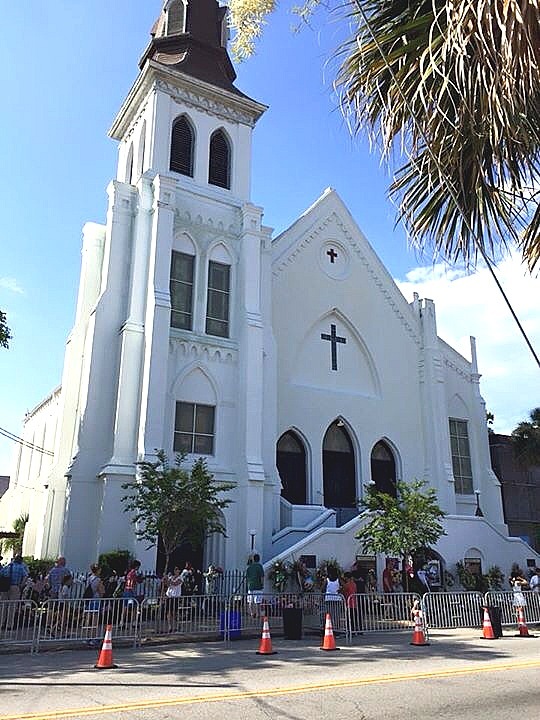 Even though it was already planned that we would visit our daughter in Charleston, as soon as I heard the tragic news of the shooting, I knew I needed to visit (Mother) Emanuel A.M.E. Church. The original plan was to go with friends on a cheap vacation to the beach, stroll through the downtown market, and visit family, but on June 17 the agenda changed. 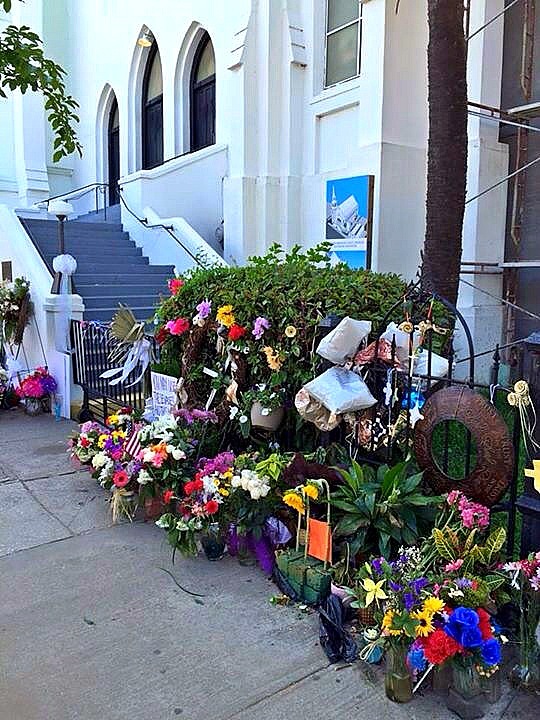 It wasn’t that difficult to know when we had arrived at Emanuel A.M.E., for the flowers and memorials of all kinds were neatly stacked against the sturdy black iron fence separating the front of the church building from the sidewalk. 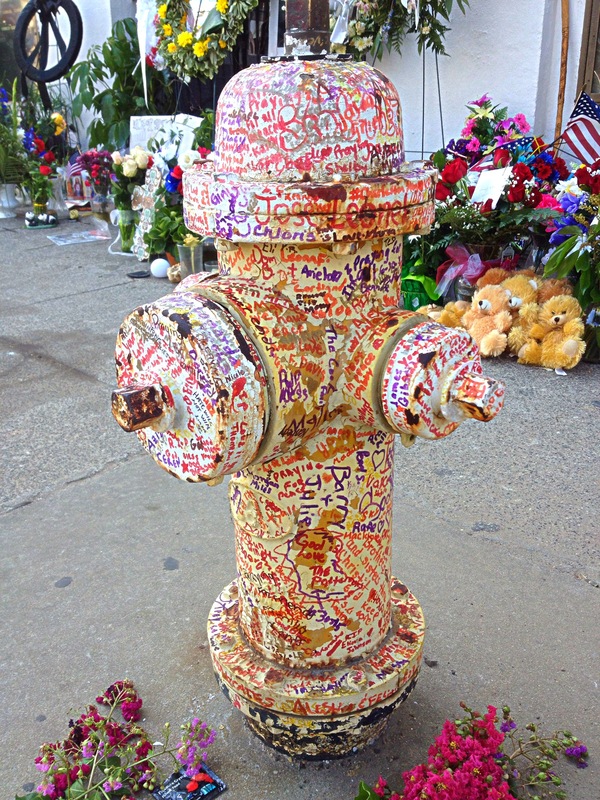 But it was more than just the flowers and trinkets that caused me to pause; it was the trees and the fire hydrant, all of them covered completely with condolences, names, and Scripture references written with colored Sharpie pens. 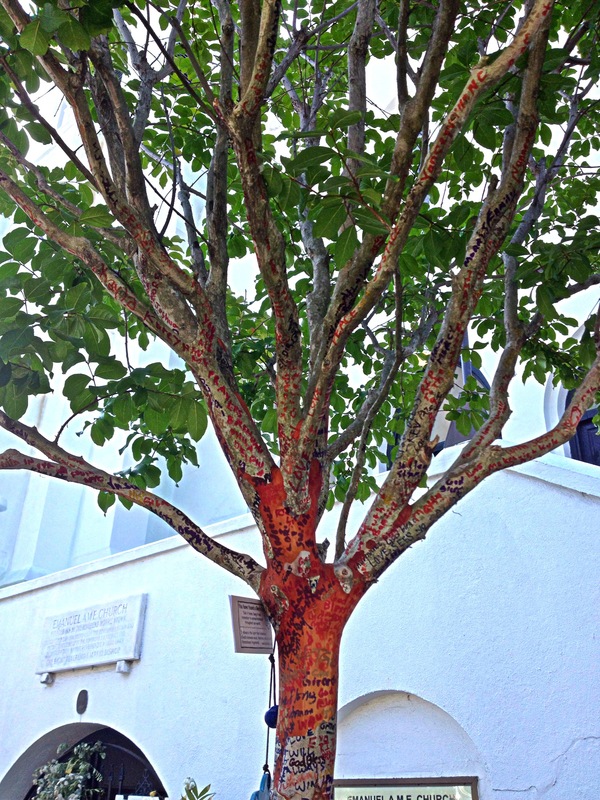 It took me a while to find a small, clear place on one of the trees, but when I did, I had to reach as high as I could without a stool. With a red Sharpie I simply wrote: John 17. 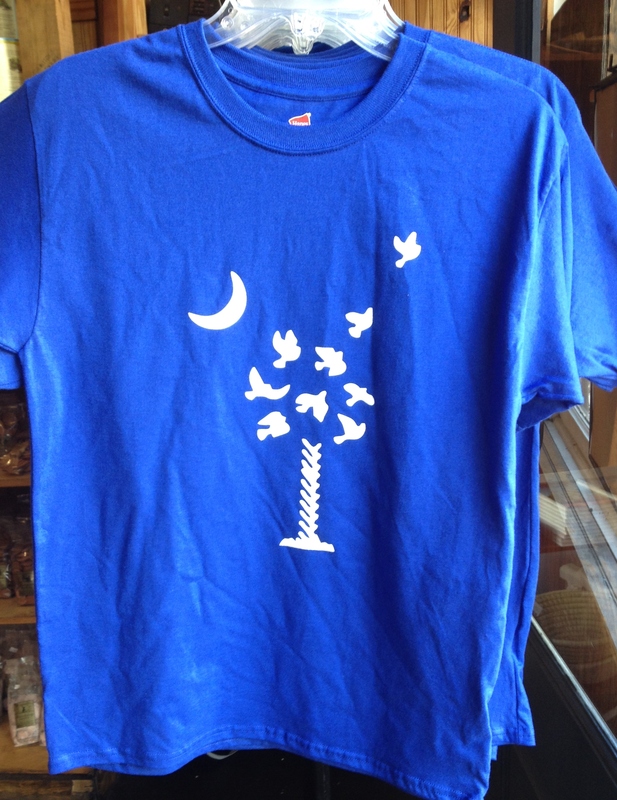 You see, unlike in the days after other tragedies, the people of Charleston, along with so many around the country, came together in a way that put evil to shame. This was especially evident by the support shown by the other churches all over the city. It was evident in the way people talked, put together fund raisers, and even in the way they welcomed the prayers from a total stranger. Now, let me say up front that I did not originally pose for the accompanying photo of me praying. Let me explain what happened. Like I said, I determined early on that I wanted to go pray on location at Emanuel A.M.E. What I did not go seeking, however, was a photo opportunity. 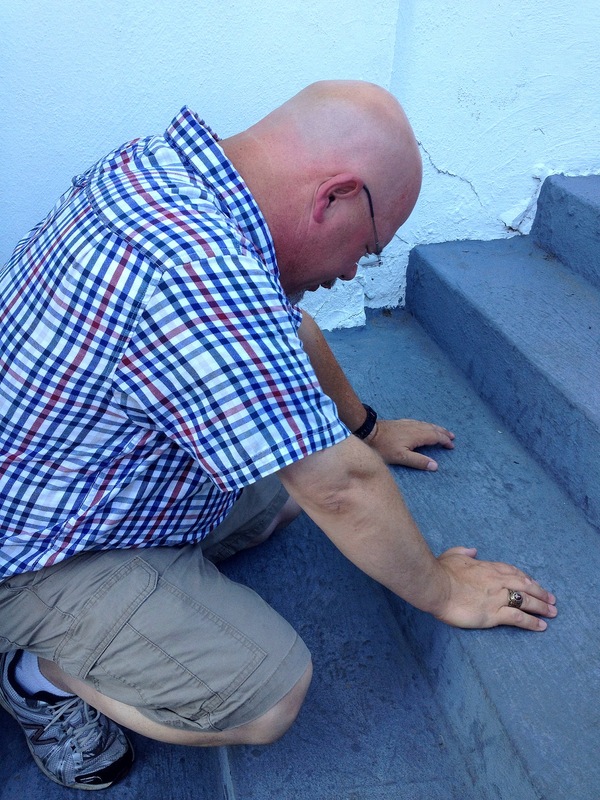 However, it was only after I was given permission to kneel and pray on the front steps that a couple of ladies (members, I suppose), decided to take my picture – with several cameras. As soon as I finished praying – praying that the name of Jesus Christ would be proclaimed through the deaths of His saints and the love of those who forgave – I started to stand. As I turned to me right, there was this lady with a camera phone saying, “Oh, I’m sorry…could you keep praying? I was trying to take a picture.” Once again I knelt down and prayed aloud. As soon as I finished praying a second time, there was another woman with another cell phone: “I’m so sorry, sir, but could you pray some more? Please?” What was I supposed to do? So, of course I knelt once more and prayed…aloud…for real. For many years to come people will be asking the same question: “Why?” Why did God allow a murderous young man full of hate to snuff out the lives of nine people during a Bible study? We may never know all the answers, for God’s ways are higher than our ways. However, a quick study of a small word in the New Testament could lend some understanding. When we look at what has happened since June 17, I cannot help but believe the deaths of those precious nine people were not in vain. Their “witnesses” in death, along with the “love that passeth all understanding” shown by their families, have been nothing less than a fulfillment of Jesus’ words as recorded in Acts 1:8! Folks, as evil becomes more and more prevalent in this world, the love of Jesus can bring healing to our cities, unity to the Body of Christ, and dumbfound the world. 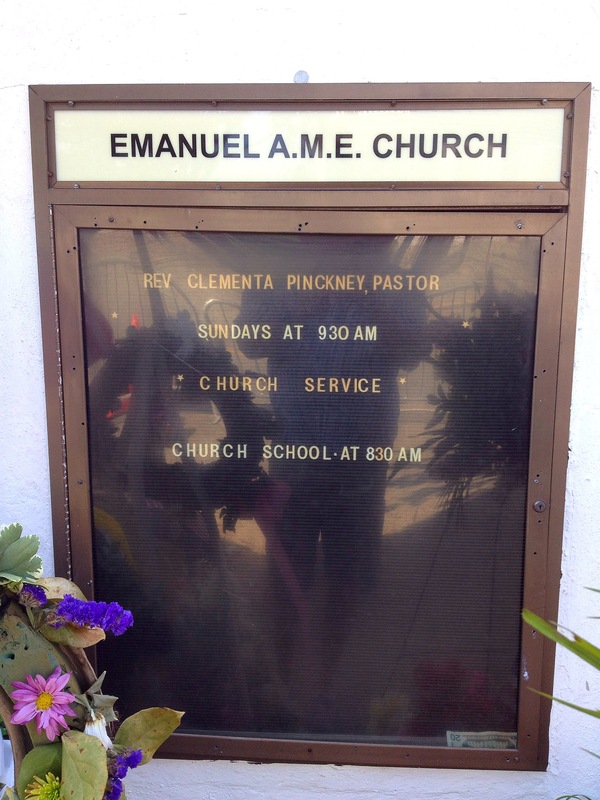 May the families of Emanuel A.M.E. be a testimony to that fact. Keep them in your prayers. Last week my family went on vacation. With the exception of Katie, the daughter who stayed home and watched the house and dogs (and used too much laundry soap), we all loaded up and drove to Charleston, South Carolina, to stay with our oldest daughter, Alicia, and her husband, Josh. But it wasn’t just family. Roy and Esther Cavender (close friends from Hopkinsville, KY) also endured the long, 8-hour drive in our mini-van to Charleston. In case you’re counting, that’s four adults and one teenager in a single vehicle for the equivalent of a regular work day. Have you ever gone on vacation with another family to another family’s house in a distant location? Let me clue you in to a fact of life – you’d better be REALLLLLY good friends. One thing about going on vacation with people that are not in your immediate family is that you come to appreciate why you are married to whom. In other words, we all have differences which we can appreciate (Isn’t that “reyeght” Roy & Esther and Alicia & Josh?). For example, my wife and I know how to get along (most of the time). We know what the other one likes and dislikes (most of the time); we know how certain situations make us feel (OK, I’m stretching it); and we know what is most likely to tick the other one off (Sure do!). That’s not the case with friends and family that don’t live under the same roof all the time. 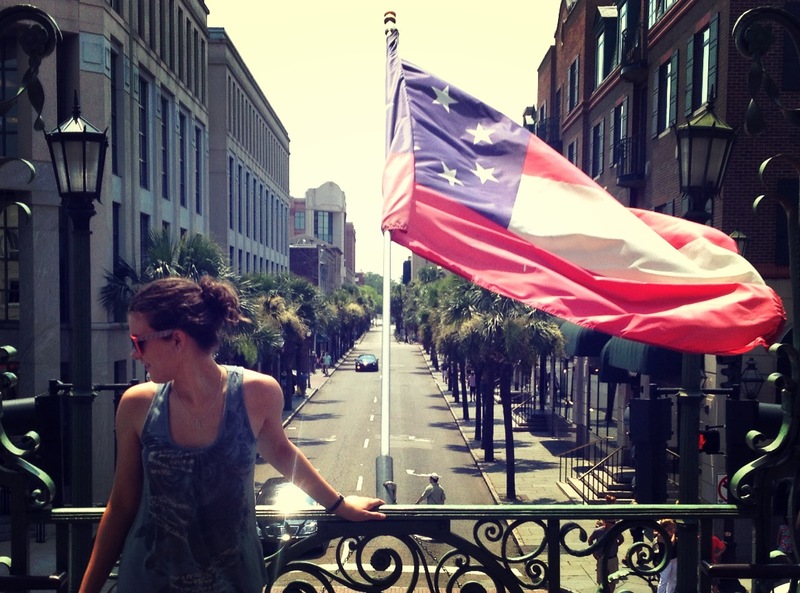 Vacationing can be a learning curve…with disputing GPS’s. Staying in someone’s house, as opposed to a hotel, can save money and offer more time to spend together, but it sure has the potential for stress. Don’t get me wrong – we’d do it again! It’s just now that it’s all over, I like the way my wife and I do things. I’m pretty sure everyone else feels the same way. 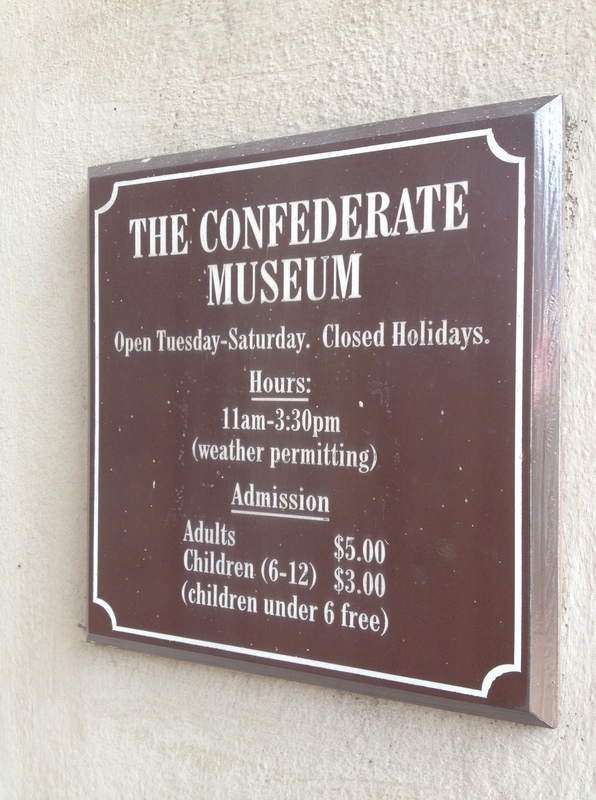 But even though there were some awkward and tense moments in and on the way to Charleston, we did have a fun and enriching time. We got to spend quality time with friends and family, meet new people, eat new foods, see new places, and experience the time away we so desperately needed. I even made a fish fly. Have I piqued your curiosity? Let me know if there’s something specific about which you’d like to hear. I’ve got a lot of stories, it’s just a matter of narrowing them down to the magic 500 words or less, you know.